I have wonderful news! Our comrade James Connolly, the General Secretary of our great union, the ITGWU, is returning to Belfast on the 19th April. He and his family will take up residence in 374 Falls Road. Come and welcome him. Come and listen to his speeches. Come and read his insightful publications. 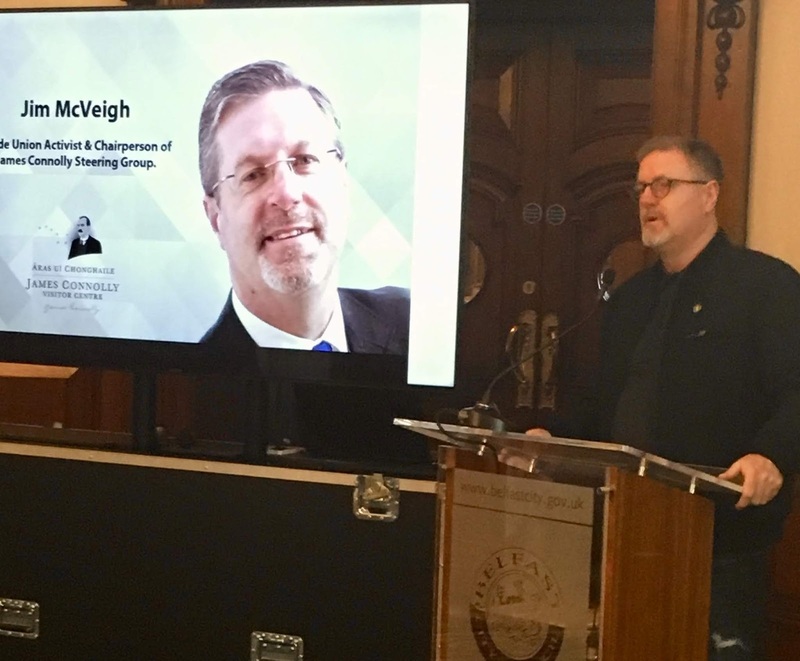 He comes to Belfast to lead us and unite the working class, not as Catholics and Protestants, not as Nationalist and Unionist but as Belfast workers united. He comes to lead us in the glorious struggle for Socialism”. 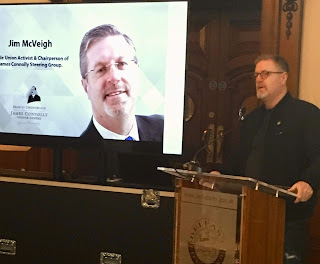 With these stirring words, Jim McVeigh, Trade Union activist and Chair of the James Connolly Association, commenced the formal launch of Áras Uí Chonghaile – the James Connolly Visitor Centre – at Belfast City Hall last week. 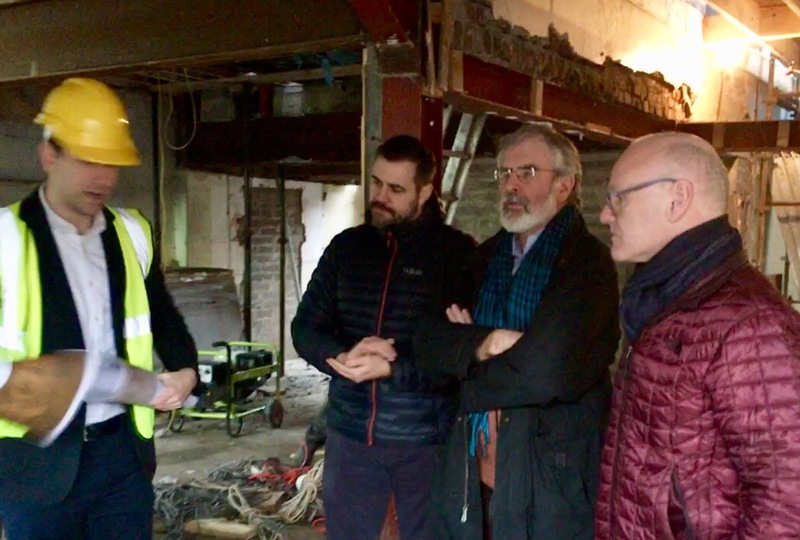 The centre itself will be opened on April 19th with a pageant along the Falls Road from Conway Mill, where 100 years ago Connolly helped organize the predominantly female workforce, to Áras Uí Chonghaile. Fáilte Feirste Thiar – the west Belfast Tourist Board – is the lead agency responsible for the development and administration of Áras Uí Chonghaile. The new centre is only a couple of hundred yards from the Connolly family home at 1 Glenalina Terrace (420 Falls Road). The last time I was in 374 Falls Road it was a shop and post office. A couple of weeks ago when I visited it again the noise was intense. Workmen were busy hammering and drilling and brickies were hard at work carefully putting the new front wall in place. Electricians were running wire. New stairs were being erected. The huge sheets of steel, which will form the side elevation of the building with the image of James Connolly emblazoned on them, had still to be erected. 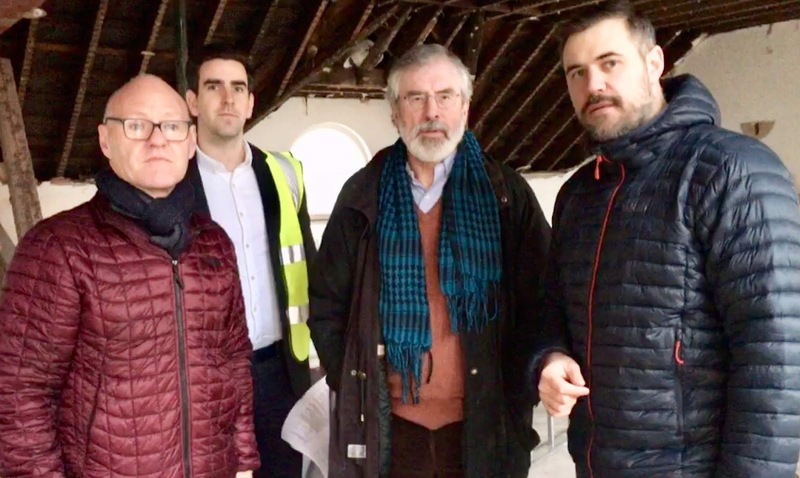 They had still not gone through the acid wash and weathering necessary for them to develop the characteristic rust-like appearance which will soon dominate that part of the Falls Road. That process was only completed last week. But Fergal Rainey of McGurk Architects is confident that the entire Áras will be completed for the April 19th opening. The purpose of the £1.4 million centre is to conserve the heritage of James Connolly and the key role he played in Irish history, the struggle for freedom and the Labour Movement. 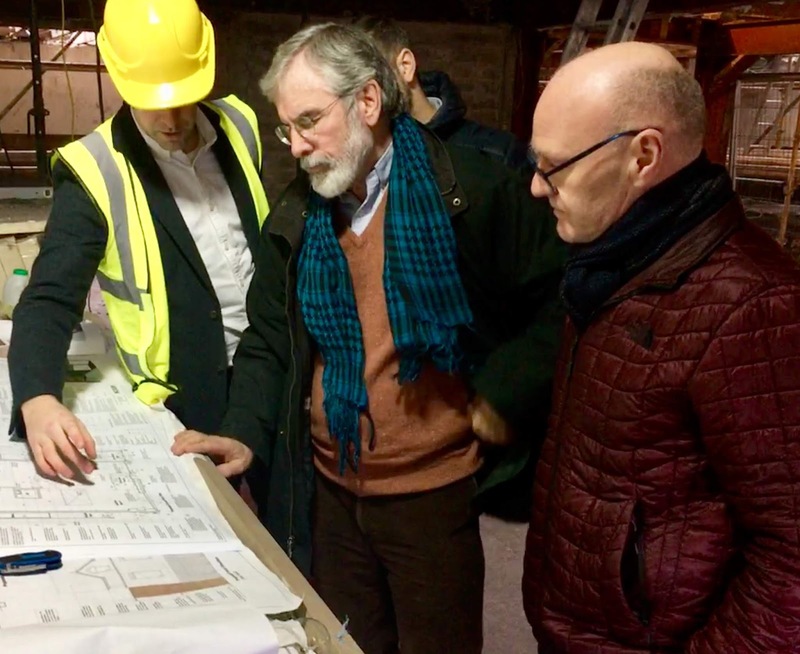 It will be a world class visitor centre exploring the life of Connolly; with a unique interactive exhibition; a library of writing by and about Connolly; a multi-functional conference facility, and an all year round programme of engagement with communities, schools and visitors and a bialann. Redhead Exhibitions has brought its considerable experience to the project to ensure that the exhibition is of world class standard. Áras Uí Chonghaile will also hold historical objects relating to Connolly, photographs and original publications, including photos never seen before. There will also be a 1935 hardback edition of a book written by Nora Connolly O’Brien, Connolly’s daughter. Incidently, I lent my copy of this fine book to a friend to help his daughter in a school project. I haven’t got it back Gary. 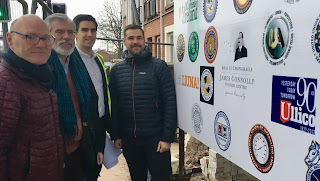 The centre has been funded by Belfast City Council and with the financial and logistical support of the American Trade Union Movement under the leadership of Terry O’Sullivan of Laborers International Union of North America and John Samuelsson of the Transport Workers Union. 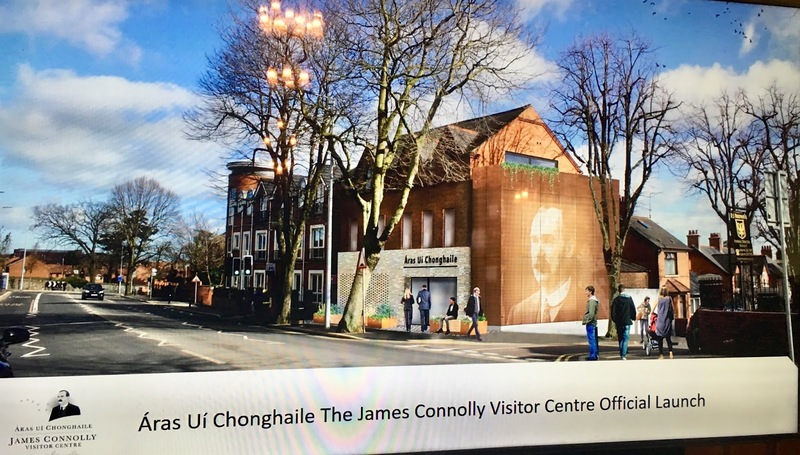 Áras Uí Chonghaile will be a celebration of the life and times of Connolly from his birth in Edinburgh in 1868 to his execution by the British in May 1916. 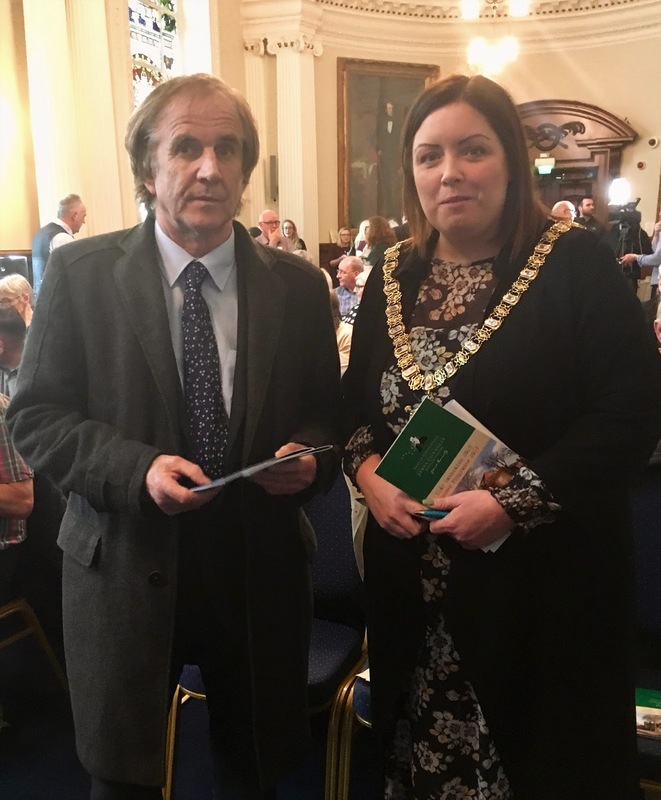 It will explore Connolly’s work as a trade union activist; his writings; his travels in Ireland, Britain and the USA; the establishment of the Irish Citizen Army and the Dublin Lockout; and his life in Belfast organizing the Dockers and Linen workers. His Belfast days did much to shape Connolly’s politics and his socialism. He was appointed Belfast Branch Secretary and Ulster Organiser of the Irish Transport and General Workers Union with is office in Corporation Street. He immediately set about organizing the Dock and Linen workers. Their conditions of work 100 years ago were hellish. The first strike he organized was by the Dockers. They were paid a penny per ton for shoveling iron ore. This was a quarter of the rate for Dockers doing he same work in Britain. Connolly organized a non-sectarian band which paraded through the streets collecting money for the strike fund. The strike ended when the worker’s pay was increased. 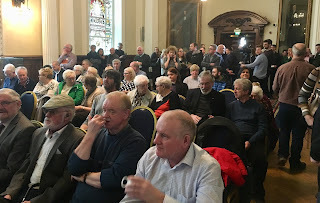 ‘The Protestant workers of Belfast are essentially democratic in their instincts, but not a single Belfast Loyalist MP voted for the Old Age Pensions Act. The loyalist MPs knew that the beating of the orange drum would drown every protest within their constituencies. ‘Such a scheme as that agreed to by Redmond and Devlin, the betrayal; of the national democracy of industrial Ulster would mean a carnival of reaction both North and South, would set back the wheels of progress, would destroy the oncoming unity of the Irish labour movement and paralyse all advanced movements whilst it endured. Connolly was a visionary. His declaration that ‘the cause of labour is the cause of Ireland and the cause of Ireland is the cause of labour’ is as true today as it was 100 years ago. Áras Uí Chonghaile is a hugely ambitious undertaking. I want to thank and commend all those who had the vision and energy to turn the dream into a reality. On April 19th – Good Friday – you are all invited to join in the pageant which will commence at 6pm at Conway Mill and walk along the Falls Road to Áras Uí Chonghaile. Be there to welcome James Connolly back to Belfast.